﻿City of Lights, Restaurant of Darkness – found. Imagine giving up control over your culinary experience. Take it a step further and give up one of your senses in the process. If this sounds enticing, BlackOut‘s “dining in the dark” may be the adventure you’re missing out on. 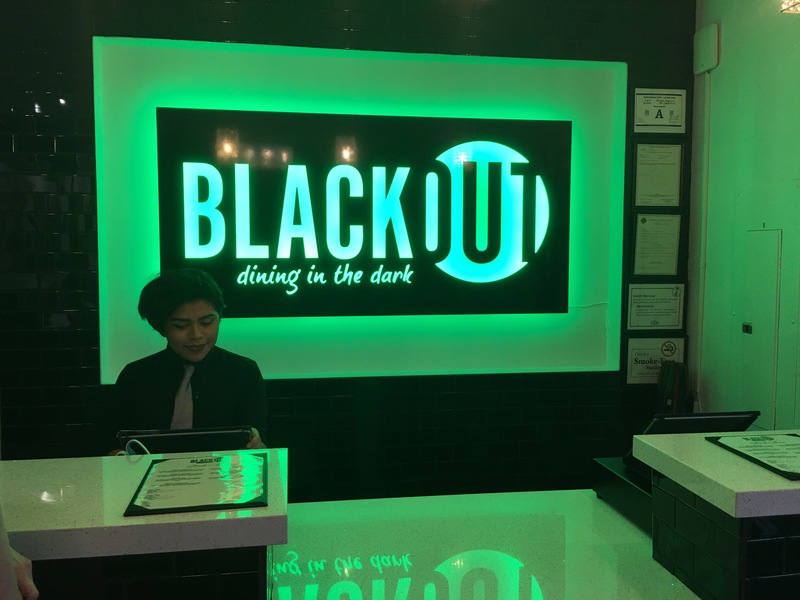 BlackOut, the brainchild of Rachel Roberts-Levi and Avi Levia, is a new dining experience in Las Vegas offering a chance to eat in total darkness. The couple also owns One Family Animal Sanctuary. Their goal is to educate the public on the ethical treatment of animals and hope to change the public’s attitude on animal consumption. They pride themselves on being ethical vegans. At BlackOut, this goal has been translated to each plant-based meal. This concept originated in Switzerland in 1999 with Jorge Spielmann, a blind clergyman from Zurich. He opened Blindekuh (The Blind Cow) with the idea that in giving up your sense of sight, you must rely on your other senses, creating a heightened experience of taste and culinary pleasure. For most, our sense of sight is the first we rely on to determine what we eat will be safe and appetizing. Think of the various colors you see when picking fruits and vegetables in the market. The vibrant reds, oranges, greens, and the various fruits and vegetables that come to mind that go with these colors. Would you eat a blue apple? There have been studies tricking people into thinking they were drinking red wine instead of white wine simply by adding red dye, thus influencing the expectations of their taste experience. What happens when visual expectations are no longer a clue and you are enveloped in complete darkness? Upon entering BlackOut, a host introduces you to the concept of the restaurant and instructs you to fill out a waiver. All light emitting devices (including phones, cameras, etc.) must be left in lockers that are provided and you must remain in your seat once seated. You are asked if you have any allergies and what flavor palette you prefer for the six-course mystery dinner- sweet, savory, or spicy. 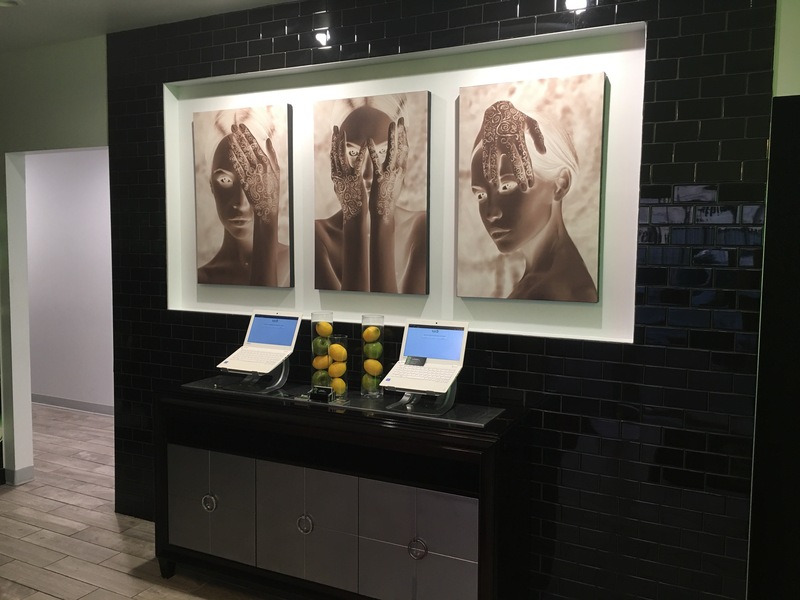 Once you have filled out your waiver and made a trip to the bathroom and lockers, you are led to your seat by a night vision goggle-clad waiter daisy-chained to your date where darkness surrounds you. BlackOut goes to great lengths to ensure that absolutely no light reaches the room you are in. You wouldn’t be able to see your own hand held in front of your face. The absurdity of the experience made me erupt into a giggle fit and wish I wasn’t wearing flip-flops. What I wasn’t expecting was an intense feeling of vulnerability—giving full trust to your server who essentially becomes your eyes for the experience. Victoria greeted us by name each time she came up to the table. She told us in detail what she was doing, where everything was on the plate (including silverware), and invited us to guess what we were eating through smell and taste alone. Another aspect of the experience was a false sense of intimacy that comes into play between you and your date as well as your server. Without visual clues, I felt like my date and I were the only people in the room even though we could hear other tables around us. Everyone seemed to talk quietly, almost a whisper never louder than the music. When the music stopped in between songs, people stopped talking until it started to play again. Without the visual noise to distract, it seemed the experience was focused solely on who you were with. It was a delight to hear tables all around us engaging in conversation with each other and not being distracted by their devices or other visual distractions. When we were finished with all six courses, we were led again daisy-chained to a curtained off area which allowed our eyes to adjust to the light before we entered into the light again. Only then were we allowed to see the menu of what we had eaten. This is an experience I recommend to even the pickiest of eaters. At BlackOut, you are free to safely explore the intricacy of your sensory experience through fine dining in the dark. The service is friendly and attentive. The food is delectable and plant-based. They accommodate vegetarian, vegan, and gluten-free diets. The secret menu is seasonal and changes on a quarterly basis. Please share your dining in the dark experiences in the comments below. What a great article! Thank you Erika!